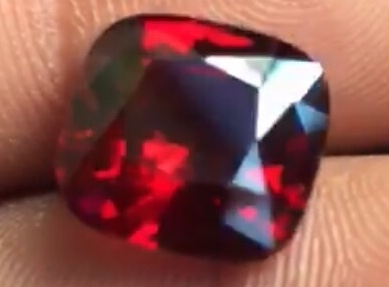 Rhodolite is the varietal name for a mixture of almandine (30-40%) and pyrope (60-70%), which are themselves two of the six fundamental sub-species of garnet. Despite the fact that its two constituent minerals usually possess pure, if somewhat dark, red hues, rhodonite is associated with a red coloration that is more purplish. In fact, some specimens from Tanzania and Mozambique are almost completely purple, and these are known by a variety of trade names including “grape garnet”, “Imperial rhodolite” and “umbalite”. It is important to note that rhodolite should not be confused with the similarly-named, black-veined pink ornamental material rhodonite, which is from a completely unrelated mineral species. However, these materials do share the same etymology, with both names having been derived from the Greek for “rose-colored”, rhodon.